Super Spell 2 Recharged is a comprehensive spelling package based on a sequential development of spelling skills, which range from the ability to spell the simplest three letter words to the most complex multi-syllabic words. The software is designed to assist students of most ages to develop their spelling skills in a self-paced and non-threatening manner. Each word is spoken and put into a context sentence to aid understanding and recall. Students using this software will improve their spelling ability, they will also gain confidence by using the five activities and accessing the extensive spelling bank of preprogrammed words. Super Spell 2 is presented within a clear web 2.0 style framework which does not distract students. Every effort has been made to ensure the program appeals to a very wide age range. The extensive general use SuperSpell word lists, the National Literacy Strategy (NLS) word lists, the User word list facility and the many teacher controls make the program ideal for: primary schools, colleges, special needs situations, English as a second language (E2L) and adult education centres. The literacy strategy word lists makes it easy for any teacher integrate SuperSpell 2 into their existing lesson plans. Although the program contains the literacy strategy word lists and links to the Key Stage 2 (KS2) curriculum, you can enter your own word lists for any subject or area you like. You could enter words from the governments Year 7 spelling bank. 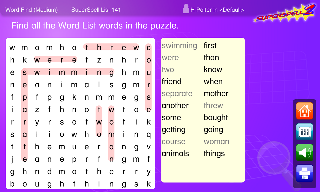 The example user word lists which come with Super Spell 2 contain words from a variety of different subject areas - Ancient Greece; Tudors; World War 2 (The Evacuees); Animals; Countries; Cities; Time; Clothes; Weather; Transport. Super Spell 2 is also ideal for use at home. Supplementary use of the program at home will enable parents and home tutors to provide vital spelling support, in many educational situations, to help improve their children's spelling. The words which are set for homework can be easily added - older children can even do it themselves. SuperSpell 2 contains a set of PDF files that produce three printed diagnostic spelling tests. These tests are designed for use away from the computer. The results from these written tests will provide valuable diagnostic information to both educationists and parents alike, and will help identify which word lists in Super Spell 2 to use. Super Spell 2 has excellent student management, reporting and record keeping facilities. The user's name, the word list being used, the words in the list, the attempts made at the words and any misspelt words are all automatically recorded. 'Classes' can also be created so that users within a specific class or group can be kept together for management purposes. SuperSpell 2 network version allows you to create a central store to access its word banks and excellent reporting facilities over your network by all computers regardless of their operating system. This makes it extremely easy to monitor pupils' progress and adapt spelling lists for everyone. The five activities in Super Spell 2 are designed to build confidence and develop spelling strategies in a structured and sequential manner. Word Memory, Word Speed and Cloze each give the user three attempts to spell a word correctly and emphasise strong sound and verbal reinforcement when the word is spelt correctly. The words in the SuperSpell 2 word list resource banks are grouped to enable the user to recognise spelling patterns and provides a unique and graded progression to English spelling. The presentation of a group of words that follow a regular spelling rule ensures a large degree of success. The computer corrects the user's responses in a consistent, non-threatening way. There is no suggestion of annoyance or frustration in the intonation of the spoken instructions. Word Find and Word Splash are fun activities that ensure a high degree of success, as well as reinforcing spelling patterns established in the Word Memory and Word Speed activities. To further encourage learning by making mistakes and correcting them each of the Word Memory and Word Speed activities have an Auto Correct Words option. The Auto Correct Words option is set on as the default setting but can be easily turned off through Teacher Utility. The word resource banks contain word lists for general spelling work for ages 6 to adult and National Literacy Strategy specific word lists for school years 3 to 6. Users can also create their own word lists and edit any SuperSpell 2 word list into a subset. Whatever your requirements are for a spelling list - SuperSpell 2 will provide the answer. Word Memory has been designed to closely follow the rules of the well - established look - cover - write - check method. A word from the chosen word list is displayed and the user is asked to write down the word (the printable Student Work Booklet can be used). The user then covers the word and types the word into the computer. This can be done either directly from the normal keyboard, or one of the optional on-screen keyboards. If the word is spelt correctly another word from the word list will be shown. If the word is spelt incorrectly the computer will automatically correct the word (if Auto Correct Words is ON) and present the word again for another attempt. After three unsuccessful attempts the computer will then show another word from the word list in use. On screen information shows the Word Resource Bank in use, the word list number, the user's score in a percentage, the number of attempts made and their progress. To encourage learning through making mistakes and correcting them Word Memory has an Auto Correct Words option. This is set ON as the default, but if required it can be turned OFF, or the default setting changed in Teacher Utility. In Word Speed a word from the chosen word list is displayed for the set word delay period. 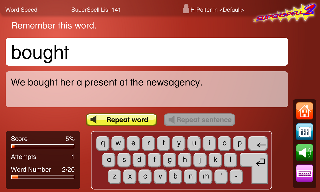 The word then disappears from view and the user is asked to type the word in (this part of the sequence is not timed). This can be done either directly from the normal keyboard, or one of the optional on-screen keyboards. If the word is spelt correctly another word from the word list will be shown. If the word is spelt incorrectly the computer will automatically correct the word (if Auto Correct Words is ON) and present the word again for another attempt. With Auto Correct Words ON and with a very short word delay selected the user will be given extra time to view the word. After three unsuccessful attempts the computer will then show another word from the word list in use. To encourage learning through making mistakes and correcting them Word Speed has an Auto Correct Words option. This is set ON as the default, but if required it can be easily turned OFF, or the default setting changed in Teacher Utility. In Word Find words from a chosen word list are presented within a grid of letters and the user attempts to find the words using the mouse. To help with this process the words in the word list are displayed to the right of the grid. When selecting a word it is important to position the cursor approximately in the middle of the first letter and drag it to approximately the middle of the last letter of the word. If the word is in the word list the word will be highlighted in the selected highlight colour and spoken (if speech is turned ON). The word will also become unavailable in the displayed word list and will be greyed out. If the word is not in the word list it will be impossible to highlight the word. Letters in the grid are sometimes used more than once to form words. Words are presented either horizontally, vertically or diagonally, depending on the degree of difficulty selected from within either Teacher Utility or Options on the Main Menu screen (4 levels are available). Easy Level: the words are presented horizontally left to right. Medium Level: the words are presented horizontally left to right, and vertically top to bottom. Hard Level: the words are presented horizontally left to right, vertically top to bottom, and diagonally left to right going down. Very Hard Level: the words are presented horizontally left to right, vertically top to bottom, diagonally left to right going down, and diagonally left to right going up. In Word Splash the user attempts to prevent a person being dunked into a tub of cold water by identifying a word and spelling it correctly. A word is automatically selected from the word list in use and the number of letters in the word are displayed as a series of dashes. Letters are selected by clicking on the keys to the right of the graphic or by using the computer's keyboard. If you are successful in locating a letter used in the word it will appear in its correct position/s by replacing one or more of the dashes. Letter keys can only be used once. To succeed the user must correctly identify and spell the word without making more than ten incorrect guesses. With each unsuccessful letter guess a piece of the dunking tank will start to appear, until eventually the person on the plank is dunked into the cold water. When the thrower starts to toss the ball, and shouts of "No, no" are heard , the user will know that they are approaching the end of the sequence for that particular word! Upon the completion of each word, correctly identified and spelt or not correctly identified and spelt, the word is displayed for a short interval. The word is also spoken if Speak Words is turned ON. The user's score is automatically updated on the screen and also recorded in the results section for each word list. In Cloze a sentence from the chosen word list is displayed with the word missing. 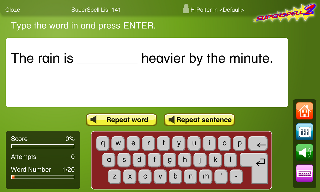 The sentence and word are read out and the user is asked to type the word in. This can be done either directly from the normal keyboard, or one of the optional on-screen keyboards. If the word is spelt correctly another word from the word list will be shown. If the word is spelt incorrectly the sentence and word are repeated for another attempt. After three unsuccessful attempts the computer will then show another sentence from the word list in use. Each of the activities have slightly different results reports. On all of the results printouts the incorrect attempts are highlighted to make it easier for busy teachers to spot any spelling weaknesses. On the Word Find results the words not found are highlighted. On the Word Splash report the letters guessed are shown which allows teachers to see if a genuine attempt was made at guessing the word. Progress and results can be printed or exported as CSV files for use with spreadsheets and other pupil management tools. The network version allows you to access the central store of results over your network by all computers regardless of their operating system. This makes it extremely easy to monitor pupils' progress and adapt spelling lists for everyone. Windows XP, 2003, 2008, Vista, Windows 7, 8 & 8.1. MacOS 10.4 or later (both PPC and Intel). † All prices exclude P&P and VAT. 1 Proof of purchase of SuperSpell 2 is required unless ordered with a Single User or Network Licence. Last modified on 12/06/16 .